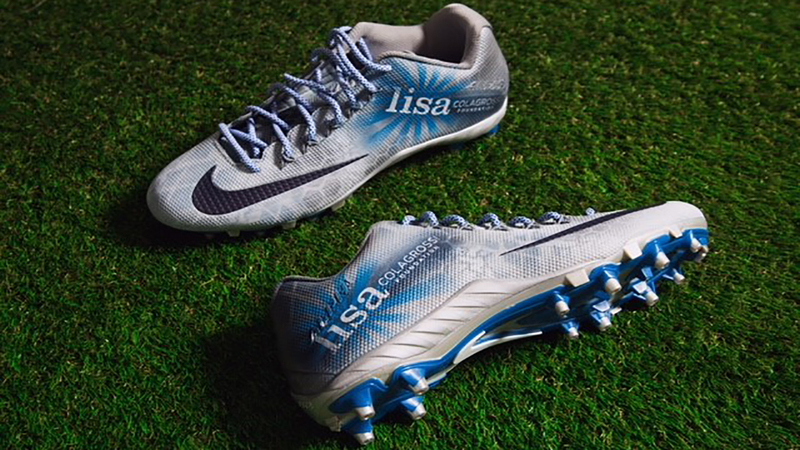 NEW YORK (WABC) -- Three NFL players took the field Sunday wearing cleats designed for the Lisa Colagrossi Foundation to spread awareness and educate the public on brain aneurysms. The foundation was founded in 2015, months after the death of Eyewitness News reporter Lisa Colagrossi due to a brain aneurysm. Todd Crawford, Lisa's husband, created the foundation in her name to raise public awareness of the condition and reduce the number of deaths. T.J. Jones of the Detroit Lions, Taylor Gabriel of the Atlanta Falcons, and Erik Swoope of the Indianapolis Colts wore the Lisa Foundation logo in honor of parents and friends lost to deadly brain aneurysms. Up to 15 million, or 1 out of 20, people are estimated to have an undiagnosed brain aneurysm in the U.S.
1,000 NFL players will lace up customized cleats reflecting their charitable endeavors as part of the league's "My Cause My Cleats" campaign.